Wash the mushroom and poach them. Drain and slice them or cut them in cubes. Season them with salt and mix together with the Baked Beans with the slices of tomato. Cut the salty bread into halves. Take away little bread to make a hole, so that you can put more filling and we let it stay firm on the bread. Stuff the mixture into the salty bread. Garnish with tomato and lemon. 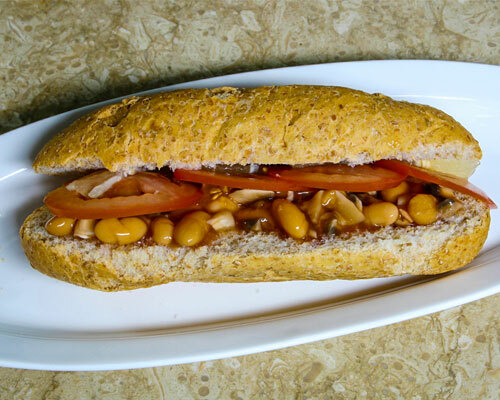 Comments: This heart healthy recipe made with the combination Ayam Brand™ baked beans & mushrooms not only offer proteins but also high in fiber, vitamins & minerals. Fiber from this dish can make you feel full for a long time, prevent cravings and help you control your appetite. It also contributes to heart health because it has no cholesterol. In addition, fiber contributes to good digestive health by promoting bowel regularity. One serve of this dish also yields whooping amounts of Vitamin C derived from lemon & tomato added in the dish which is vital to the function of a strong immune system. Also, Vitamin C can be helpful for preventing the development and progression of atherosclerosis and heart disease.